At Earth Yoga Studio, Yoga Teacher Training is not just about learning how to teach yoga. It is an all-encompassing approach to learn about yoga as a lifestyle, and more than anything, it is a way to learn about who you really are! We had an amazing group of students in 2018. Just as they learnt from us, so have we learnt from them! And we have no doubt that the 2019 students are going to be just as fantastic! Following our focus of caring for our environment, manuals will now be emailed rather than printed. YTT students will be required to read and prepare material before each class to allow for deeper exploration into various topics. During lectures we will address key concepts and discuss how the material applies to our lives, not just as yoga teachers, but also as individuals. The students’ individual needs will be discussed to consider fears and weaknesses, working in ways to get to the root of emotional blockages and limiting self-beliefs. Within a safe environment and through the reflection of fellow YTT students, each student has the opportunity to find their own path to start living as their true selves . By reducing the printed material, not only are we looking after our environment, but we are able to lower the cost of the 2019 Yoga Teacher Training! Deposit @ R6 000 secures your space. Limited space, please register early and start with the material and classes now already! Course fees can be paid off monthly depending on when you start and pay the deposit fee. Discuss, Explore and Experience the History and Philosophy of yoga through story, dance, yoga asana and acting out the scenes from the old texts. Have fun while you learn! Learn Yoga Anatomy by applying it to your own body and students. Practice to teach with feedback. We will focus on class sequencing, language and speech, observation and adjustments. Please view the public google calendar with exact dates and modules here (look from 26 January 2019). A regular yoga practice at Earth Yoga Studio is preferred. If you are not a member of Earth Yoga, you will be required to do an interview. Your state of health should be good. 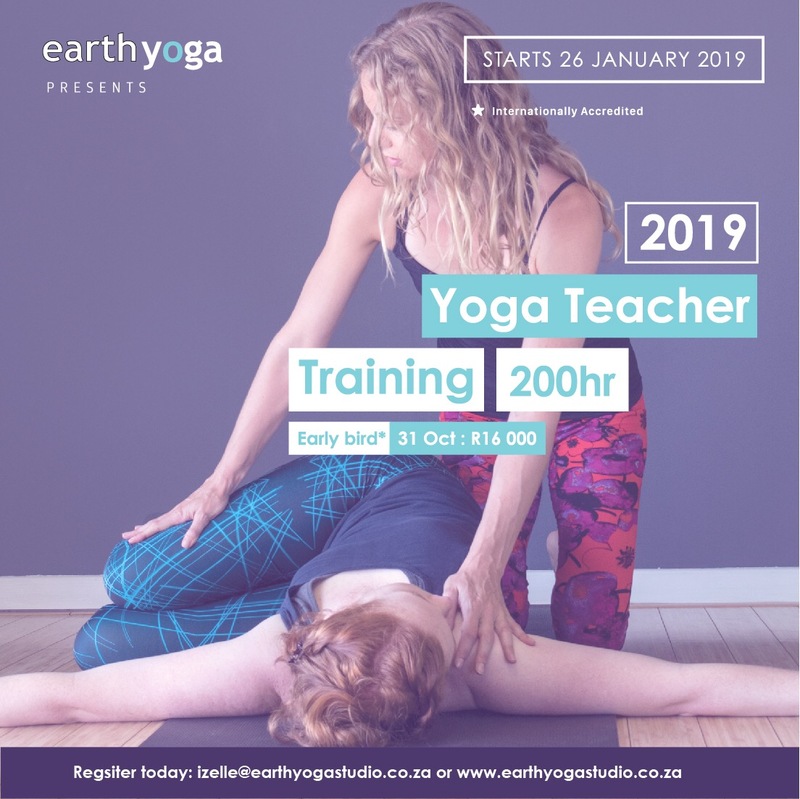 100 classes at Earth Yoga studio to be completed by 10 August 2019. Book Reports must be submitted 1 week before the training starts (19 January 2019), or admission will be refused. an elaboration on how this material could be useful for a yoga teacher. Yoga Anatomy by Leslies Kaminoff and Amy Matthews. No book report required as we will be covering this book during Yoga Anatomy modules. *These books are not included in the training fees and must be ordered from Amazon or book stores. If you cannot get hold of these books or if you cannot afford to buy them, you can borrow these from Earth Yoga Studio. You will be required to complete all the assignments, book reports, as well as attend all lectures and workshops, pass all exams and complete 100 classes at Earth Yoga Studio in order to qualify for the certification. If you miss a lecture it is up to you to get the material from fellow students. This is comprehensive yoga education that exceeds the requirements of the Yoga Alliance’s 200 hour certification. This yoga teacher training is lead by Experienced Registered Yoga Teacher (E-RYT 200), Izelle Nair and assisted by Malcolm Nair. Guest teachers include Sanjay Mithal, Lucy Draper-Clarke and other surprise guest yoga teachers. No refunds will be allowed if students do not show up for class, cancels last minute, do not complete the work as required, or disturbs the classes and students. Earth Yoga Studio has the right to refuse entry to classes if students are disrespectful. Students are required to act respectfully towards all teachers; students and themselves. If students do not complete the work as required certificates will not be issued.